Should Europe Dictate Our Number Plates ? British number plates have been part of our automotive heritage since the turn of the century. 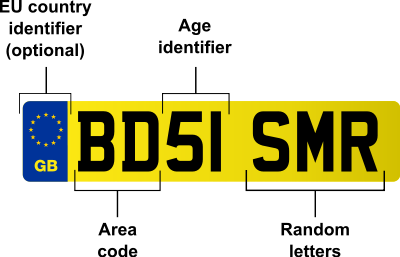 The number plate has evolved over the last 110 years to it’s current format and predates even the Driver and Vehicle Licensing Agency, DVLA. When the vehicle registration numbers were first displayed on number plates the front and back plates were black with white letting. The index of vehicle registration numbers was managed locally by county council, each having there own Letter or Letters. A1 was the first ever registration number which was allocated in London. As the popularity of the motor vehicle increased and by virtue the registration numbers in circulation accelerated the need for a central UK body emerged. The DVLA have for a number of years handled the registration number index. The number plates on our vehicles have gone through many changes since the original black and white plates. As road safety and modern technology enhancements have developed the number plates have advanced to it’s current guise. These proposals, the work of a Dutch MEP, are supposed to be aimed at making it easier to travel through other European countries and protect against fraud. This if successful could give way to a European index of vehicle registration numbers.